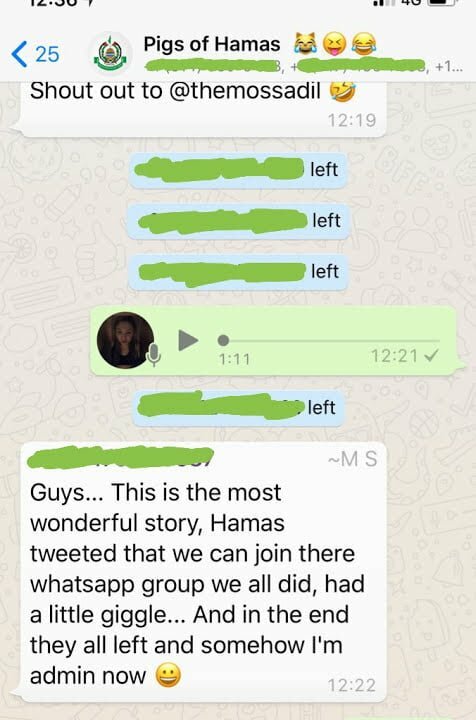 Home Mossad Operation: WhatsApp With Hamas? The Twitter account @HamasInfoEn tweeted on Tuesday an invitation to join their WhatsApp group for the latest “statements and comments” related to The Hamas Movement. As with any time Hamas tries new technology, this went exactly according to plan. Within 10 minutes, dozens of our agents infiltrated the group, and the WhatsApp group’s founder’s telephone number was exposed. After quickly realizing their plan was thought through like a frat party roof jump, those responsible for creating the room quickly abandoned ship, causing one of our agents to become group admin by default. Meanwhile, in The Mossad’s private messages, this happened (read to the end). And now, Hamas learned not to use Zionist technology.